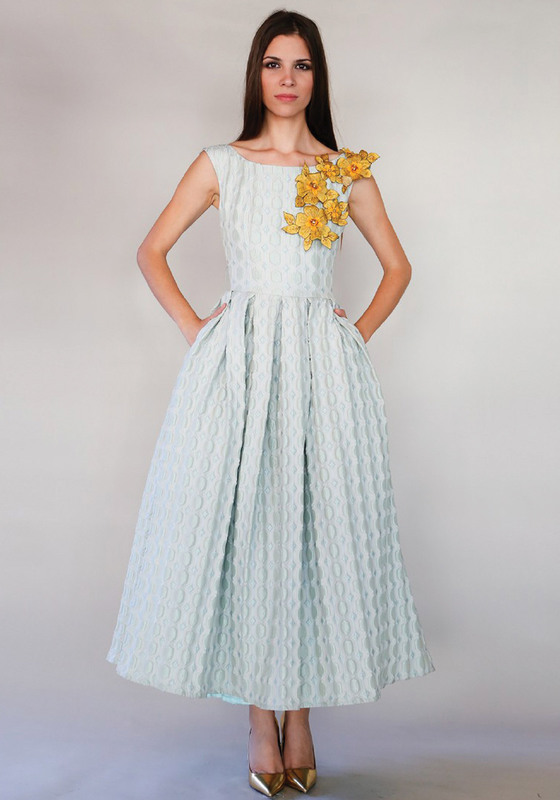 Mass by Matilde Cano presents this show stopping dress in a beauiful mint green shade which has a subtle two tone tint. A lovely choice to wear with metallic heels for an important wedding or day at the races. Designed with a cap sleeve fitted bodice and very full ankle length skirt which is multi lined to create extra volume. Made from lightweight fabric which is embossed throughout with a geometric print. Finishing touches include a detachable satin ribbon at the waist and an eye-catching mustard applique floral pattern on one shoulder.